It’s that time of year again when the leaves are turning red, orange and gold, and starting to drop to the ground. These leaves provide nutrients for the trees they came from and also shelter for many insects. It may surprise you to know that most of our butterflies and moths overwinter in the leaves in the form of eggs, caterpillars or chrysalis, and even some adult butterflies such as the Questionmark, Comma or Mourning Cloak spend the winter sheltered in the leaves or bushes. 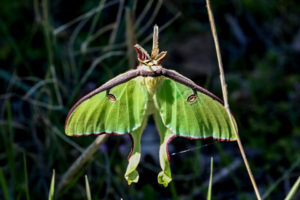 Luna moths and swallowtail butterflies disguise their cocoons and chrysalis as dried leaves which wait in the litter until spring to emerge. 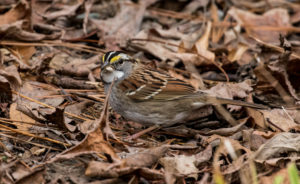 Lots of insects use the leaf litter as a place to live or over winter, and our birds know this is a good place to look for food. 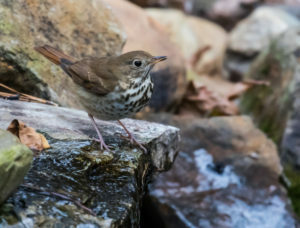 Hermit thrush, white-throated sparrows and other birds can be seen kicking and picking through the leaves for bugs to eat. So many insects live in the leaves: spiders, snails, worms, beetles, millipedes and more – and they support chipmunks, turtles and amphibians which rely on insects for food. So, sit back, relax, enjoy the leaves and don’t work so hard at tidying up the yard because those leaves are providing a lot of good to wildlife. Research has shown that a thin layer of leaves does not harm your lawn, but if you are concerned about it then blow or rake the leaves to another part of your yard. After all it is free mulch and provides much needed nutrients to your trees and plants. It’s best not to shred the leaves as that will destroy many of the insects, and bagging or blowing the leaves curbside is like giving away free mulch. An even better approach is to reduce the amount of green lawn and replace it with native plants. Take back that time you spent removing the leaves and start enjoying them and the benefit it provides to wildlife and your yard!